One thing that I put off in my business for the longest time was creating email templates. It was not at the top of my priority list, as it felt tedious and non-essential, and now I wonder why in the world I waited so long to set them up. And don't worry... if it's not at the top of your priority list either, I totally get that. 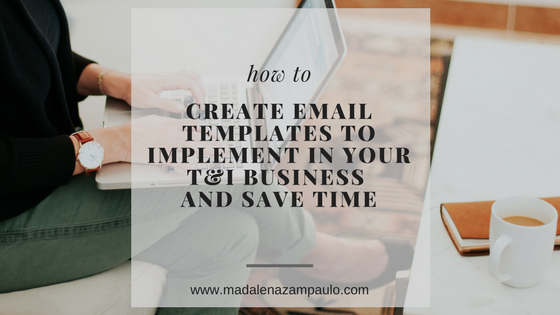 To save you some time, I'll be sending out a checklist of the email templates you should have at the ready for your translation or interpreting business. It will only go out to subscribers on my email list. So, sign up below and watch your inbox! When it comes to saving myself and my team time on daily business tasks, templates are our lifeline. We already had templates set up for all the files we use with clients: proposals, service agreements, invoices, etc. But we hadn't yet set up templates for actual emails. And you know how much time we spend in our email every day! Good grief... what was I thinking? Here's how we did it. 1. We created a list of all the tasks we do for the business. This alone was half the reason for putting this off for so long. But when it came time to actually make the list, it took all of 10 minutes, if that! 2. From that list of tasks, we made a sub-list of all the emails that we tend to send which are related to those tasks from start to finish. We came up with emails to and from clients, to and from translators, interpreters, etc. 3. For one week, we took a few minutes each day and knocked out drafting the email templates. Now, of course we don't just send off a copied and pasted template email every time we are working on a project with a client or a translator. We definitely tweak the email to fit the project and the details of the message. However, for the most part we're not typing up emails from scratch anymore, especially those we tend to send most often. Another way to do this is to look at the last 20 or so emails in your Sent box. What do you tend to send out over and over again to clients and colleagues? That's a great place to start in preparing a list of templates to create. It doesn't have to take you hours at a time to knock this out. We did this in about 15-30 minutes a day in a single week and we were done! We now have over 40 templates that we use. Can you believe it?! Forty! Imagine how much time we are saving now by not typing out those messages time and again on a daily basis. Whew! I'm almost embarrassed that it took me nearly almost 10 years in business to do this. But, live and learn, right?